Today’s post comes from Jim Holland. Jim’s passion is product management and product marketing. With over 20 years of technology industry experience, he has a fresh and current perspective in leading product management teams and has a gift for taking conceptual ideas and turning them into strategic reality using methods based on market sensing best practices. Enjoy the post and don’t hesitate to tweet your comments to Jim. What images do you create when you hear the words, Flying Monkeys? Perhaps the creepy, winged creatures from the Wizard of Oz or the Broadway remix Wicked, the ones that are villains’ henchmen and carry you off to the inevitable showdown with the Wicked Witch? While leading a team of Product Management and Marketing professionals not long ago, I coined the term “Flying Monkeys” for all unsolicited requests from executive management on behalf of customers and prospects that surfaced while executive were on the road. Imagine you’re sitting in a product planning meeting with your favorite product team. You’re engaged in a lively conversation when all of a sudden, Flying Monkeys dive into the conference room via as vibrating Blackberry’s, urgent emails, flashes of instant messages and sigh of the onslaught – Flying Monkeys – Flying Monkeys announce the arrival. The monkeys quickly grab product management, marketing and development resources, and quicker than you could say, “there’s no place like home” three times, your product roadmap, release content, development resources and team are tossed into turmoil like a Kansas barnyard in a summer twister. As a leader and messenger of the market, how do you handle these disruptions? 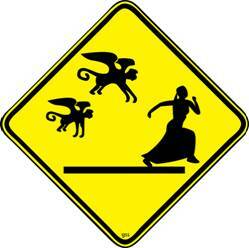 Product management and its leadership have to be vigilant and plan for the ambush of Flying Monkeys. While product managers know they have all the responsibility and none of the authority, you must focus on what matters most, and be grounded in product management best practices that bring consistency and irrefutable evidence to any conversation. Leaders of product management have a responsibility to establish and maintain visibility into the executive team, and provide regular updates on strategy, delivery and financial success, using the product team to support all conversations. If your executives regularly connect with customers and prospects, prepare them in advance, and let them know that you are available to discuss any topic in a separate meeting. Another avenue that many product management leaders fail to utilize is internal relationships. Maintaining a relationship with executive administrators, travel, finance, sales and development can provide valuable information on travel schedules, agendas and the details that will reinforce the emergence of Flying Monkeys. Credibility – leadership begins with credibility. If people aren’t willing to believe you and trust what you say, then there is no way you’ll be given authority to do anything significant. Commitment – demonstrate commitment to your product’s success. In your current job as a Product Manager, have you bound yourself to the success of your product? Or are you just going through the motions and simply doing the job? People want to see that product managers truly care about product success and figuring out what is right and best for their product. Communication – No amount of credibility can be retained if communication barriers exist between a leader and his/her followers. Leaders must be able to communicate their thoughts, ideas, visions and strategies clearly and succinctly, and in such a way that those listening are inspired to want to be part of the plans the leader is proposing. Courage – the most challenging of the 4 Cs. The difference between a leader and a manager is the leader’s ability to take risks, blaze new trails, and have people follow him or her down those trails. Leaders can be praised when they succeed, but will be criticized roundly when they don’t. How can Product Management and its leaders ground the Flying Monkeys? By creating credibility in their role and communicating effectively, and showing leadership they are committed and willing to stand by their beliefs and facts. As leaders of product management, it is your obligation to be the voice of reason and sound decisions. The Product Management Perspective (as Mike would say): As the messenger of the market, product management cannot be carried away by Flying Monkeys or allow the disruptions. Product managers and those leaders who manage them must establish and maintain credibility internally, in order to confidently communicate externally. When you create a foundation of leadership based on strong executive relationships, you eliminate the Flying Monkeys before they ever appear. Categories: Leadership, Market-driven, Product Management, Team Building | Tags: balance, committment, Communication, courage, credibility, Flying Monkeys, interactions, Jim Holland, success, unsolicited requests, Yin-Yang | Permalink.